This reminds me of my brother's favorite joke. Q: What did the man say when a herd of elephants went by? A: He said, "There goes a herd of elephants!" Q: What did the man say when a herd of elephants wearing sunglasses went by? A: Nothing, 'cuz he didn't recognize 'em. 10 Responses to Best. Disguise. Ever. ….’cause when your this cool, the sun shines on you 24 hours a day! 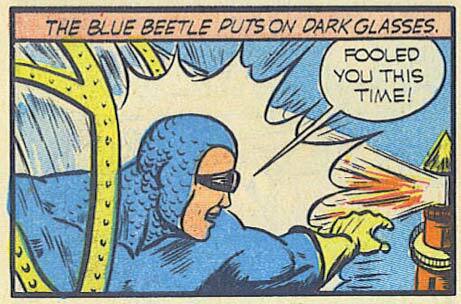 is Blue Beetle taunting a lighthouse? Either it’s the best disguise, or the dumbest villains! I don’t know what you guys are talking about. I don’t even see the Blue Beetle in this picture, just some guy in dark glasses. Wait, dark glasses and a mask? That’s disguised squared! @Myro – One more element and he’ll be invisible! Add a cowl! Add a cowl!